Private security guards and town hall jobsworths are being armed with sweeping police-style powers, it has emerged. For a few hundred pounds, state and private sector employees can receive Home Office accreditation. This allows them to hand out fines for a raft of offences, from dropping litter to riding a bike on the pavement. They can also stop cars to check their tax discs, seize alcohol from underage drinkers and demand people's names and addresses. The uniformed, badged army of snoopers will become a vital part of the 'extended police family', ministers say. 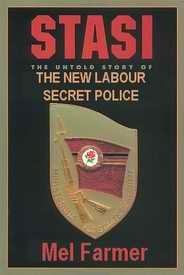 But privacy campaigners have dubbed them Home Secretary Jacqui Smith's 'Stasi' after the East German secret police. Phil Booth of NO2ID said: This is a sinister move towards a Stasi snooper state in which jobsworths are devolved the powers of the police - including the right to demand you identify yourself. Shadow Home Secretary Dominic Grieve added: This is a consequence of the Government's obsession with policing on the cheap as well as their staggering complacency towards the extension of surveillance by an increasing amount of different bodies. The public will be angered that the Home Office is seeking to take serious powers that should be appropriately applied by the police and encouraging them to be given not just to local councils, but also to private firms. The public want to see real police on the streets discharging these responsibilities, not private firms who may use them inappropriately - including unnecessarily snooping on the lives of ordinary citizens. 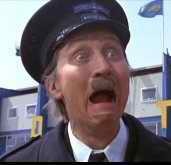 Details of the new army of police-style officers emerged in Home Office papers released today. There are already 1,400 town hall and private sector staff accredited, and ministers want a dramatic expansion of the scheme. Called the Community Safety Accreditation Scheme, it allows the likes of security guards, park wardens, car park attendants and store detectives to boost their roles if they undergo training and pay a small fee to their local police force. They can wear a special badge, and a uniform approved by the local chief constable. At present, they are wearing their employer's existing uniform with the badge sewn on, but police chiefs could eventually be encouraged to decide on a standard uniform across their force area, the Home Office said. It also revealed that chief constables are reviewing the scheme, a move which could lead to even greater powers being handed out. Councils are recruiting 'citizen snoopers' to report litter louts, dog foulers and even people who fail to sort out their rubbish properly. The 'environment volunteers' will also be responsible for encouraging neighbours to cut down on waste. The move comes as local authorities dish out £100 fines to householders who leave out too much rubbish or fail to follow recycling rules. It will deservedly fuel fears that Britain is lurching towards a Big Brother society, following the revelation this week that the Home Office is extending some police powers to council staff and private security guards. Critics said the latest scheme could easily be abused and encourage a culture of bin spies and curtain twitchers. Recruitment adverts appealing for the unpaid environmental volunteers have appeared across the country in recent months. In Hampshire, Eastleigh council wants locals to monitor local environmental quality and report 'issues' involving recycling and waste. In East London, Tower Hamlets is recruiting volunteers for a crackdown on reluctant recyclers. Other councils are expected to launch similar schemes. Officially, the volunteers are not encouraged to spy on neighbours or report them. But councils are unlikely to ignore tip-offs. Eastleigh has already taken on around a dozen snoops who answered an advert in a council newsletter which said: Volunteers will be involved in reporting issues in their area such as recycling, waste, fly-tipping, graffiti, dog fouling and abandoned vehicles. Tower Hamlets calls its volunteers environment champions. According to the council they report on a number of environmental crimes, issues and concerns, such as graffiti, dumped rubbish and abandoned cars. Between talk of broken society and ever-increasing powers of police surveillance, there seems to be a competition between politicians to make us miserable. The story of Milly, an eight-year-old cat who disappeared out of window in Whitstable two weeks ago, has much to tell us about the petty-minded forces that have come to replace proper policing in this country. Her owners, Stephen and Heather Cope and their son Daniel, 13, searched high and low for Milly, then, failing to find her, did what any normal person would do: put up posters to see if anyone had seen her. The next thing they heard was from one of the local council community wardens, who rang the telephone number on the poster and threatened them with a £80 on-the-spot fine for antisocial behaviour. Seldom can there have been a more officious, twerpish enforcement of the law, but this kind of action is now one of the established parts of this dreadful government's legacy. As the police retreat from the streets, we are prey to every type of snoop, informant, busybody and vindictive martinet, all of them licensed by the government's accreditation scheme so that they may demand our names and addresses, photograph us, check car tax discs and seize alcohol, issue fines for truancy, rowdiness, graffiti and dog fouling. So let us start thinking logically about crime, punishment, policing and the cause of our problems. Let us end this punitive regime. Let us put policemen back on the beat, throw the likes of Jacqui and Hazel out of office and return all their spies and accredited jobsworths to the twilight of their power-crazed fantasy lives. Children from eight years old have been recruited by councils to "snoop" on their neighbours and report petty offences such as littering, the Daily Telegraph can disclose. The youngsters are among almost 5,000 residents who in some cases are being offered £500 rewards if they provide evidence of minor infractions. One in six councils contacted by the Telegraph said they had signed up teams of environment volunteers who are being encouraged to photograph or video neighbours guilty of dog fouling, littering or bin crimes. The covert human intelligence sources , as some local authorities describe them, are also being asked to pass on the names of neighbours they believe to be responsible, or take down their number-plates. Ealing Council in West London said: There are hundreds of Junior Streetwatchers, aged 8-10 years old, who are trained to identify and report enviro-crime issues such as graffiti and fly-tipping. Harlow Council in Essex said: We currently have 25 Street Scene Champions who work with the council. They are all aged between 11 to 14. They are encouraged to report the aftermath of enviro-crimes such as vandalism to bus shelters, graffiti, abandoned vehicles, fly-tipping etc. They do this via telephone or email direct to the council. Matthew Sinclair, of the TaxPayers' Alliance, described the recruitment of children as downright sinister. We are deeply troubled by these developments – they are straight out of the Stasi copybook. 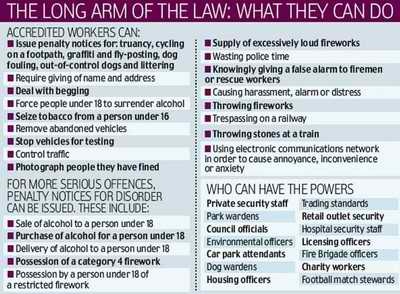 There is a combination of ever-stricter rules and ever more Draconian attempts to control people. Tradesmen working for UK local authorities are to be asked to report signs of child abuse and neglect as they visit the homes of council tenants. The plumbers, electricians and carpenters will be issued with a checklist of signs to look out for. Training will last just half a day. But critics believe the use of workers untrained in such a highly complex field could backfire. They say that children who are at real risk could be overlooked because social workers with already bulging caseloads could be bombarded with baseless complaints. One of the first councils to pilot the scheme will be Lincoln, which later this month is expected to approve the policy under which about 200 front-line staff will be given four hours' training on child abuse, with 600 backroom or office workers attending even shorter awareness briefings. The front-liners include any employee who visits homes as part of his or her job, including rent officers. Council-employed sports coaches and leisure-centre staff, who come into daily contact with children, will also be trained. Child welfare charity AIMS condemned the idea as 'ludicrous'. Its spokeswoman Jean Robinson said: This will just lead to a huge increase in the number of false cases being reported and you won't be able to find the needle because the haystack will be so vast. This is a highly complex area and not one for amateurs. Of course, if anyone, council employee or not, saw a child who was clearly being beaten or starved, their basic humanity would hopefully lead them to report it but the idea of council plumbers and carpenters being semi-trained and seen as some sort of child-abuse spies by the people they are supposed to be serving is rather sinister. A Conservative council has been criticised for recruiting 2,000 residents to snitch on their neighbours for litter infringements and anti-social behaviour. Harrow Council in north west London wants 2,000 people - one for every 100 residents - to sign up as a Neighbourhood Champion and report minor crimes, anti-social behaviour, litter and vandalism. Campaigners have accused them of recruiting an army of snoopers and said the scheme would lead to less trust and more surveillance . The council spokesman claimed they wanted to restore old-fashioned community values . If the £70,000 plan is approved this week, officials will begin recruiting volunteers with the aim of starting the scheme next year. Each one will be given training from town hall officials and police officers and issued with a manual setting out their role. Once the scheme is up and running, they will be given access to a council website to record their reports. A council spokesman said they wanted the volunteers to be a point of contact for the council and report abandoned cars, graffiti and other problems. Four fifths of residents questioned in a survey backed the idea of street champions for every neighbourhood. But Alex Deane, director of campaign group Big Brother Watch, said the Orwellian scheme would create an army of council snoopers . He said: So now councils are trying to get us to spy on one another. If they're successful it will lead to even less trust and ever more surveillance. An Orwellian big brother culture depends on everyone spying on everyone else - just as Harrow has planned. Sabina Frediani, campaigns co-ordinator at human rights group Liberty, said: Everyone should feel able to report suspicions of crime without any special badge of approval from the local authority. But as the recent abuses of surveillance powers demonstrate, giving some citizens extra responsibilities is difficult and potentially dangerous. Civic duty is one thing but policing is best left to the professionals. Members of the British public will receive £500 rewards to shop their neighbours via telephone hotlines under a scheme announced today. The handouts will go to the first 1,000 people who provide tip-offs that lead to an unlawfully occupied home being repossessed. The government plans are aimed at the illegal sub-letting of social housing. In London, £250,000 will be available in rewards. As well as hotlines, special websites and email addresses will be set up to allow informants to pass on their suspicions, while there will also be publicity campaigns to encourage reporting. Ministers say the cash incentives will help ensure that all council and housing association homes are lived in by those genuinely in need. Ministers say the scheme, which will cost £4 million, will help tackle other problems such as prostitution, drug production, illegal immigration and anti-social behaviour that can occur in sub-let housing. But critics said the payments were a further dangerous example of ministers encouraging unwarranted snooping. Dylan Sharpe of campaign group Big Brother Watch claimed the move showed the Government was creating an army of citizen snoopers . Edinburgh City Council has begun sending staff on courses designed to train them to look out for anything that might resemble terrorist activity . Staff sources say that the sessions have included being told how to spot anything suspicious, and being asked to report anything – no matter how trivial – to police, such as quantities of empty bottles of bleach. Support workers who visit a range of clients in their own home including vulnerable groups, people with addictions and elderly people, have been among the first to get the training. Concierges, community safety teams and other front-line staff across the council are also to be sent on the sessions, which are hosted by police as part of the Home Office's counter-terrorism strategy. This is disgraceful fear-mongering that erodes trust in society and encourages spying, snooping and suspicion. A sad state of affairs. The advertisement, produced in conjunction with national radio outlet TallkSport, promotes the anti-terrorist hotline and encourages people to report individuals who don't talk to their neighbors much, people who like to keep themselves to themselves, people who close their curtains, and people who don't use credit cards. This may mean nothing, but together it could all add up to you having suspicions, states the voice on the ad, before continuing We all have a role to play in combating terrorism (we're all indentured stasi informants for the government). If you see anything suspicious, call the confidential anti-terrorist hotline... if you suspect it, report it, concludes the commercial. Councils across Britain have recruited thousands of citizen snoopers to report what their propaganda calls environmental crime . According to the PR they target dog foulers, litter louts and neighbours who fail to sort their rubbish properly. The volunteers spy on their neighbours and are encouraged to take photos of environmental crime and send them in with location details for a rapid response. They are given hand-held GPS computers for the task or phone cards to cover the cost of using their own devices. Evidence gathered this way is sometimes used in criminal prosecutions. There are already 9,831 snoopers signed up, a 17% increase on the number two years ago. A further 1,310 are set to be recruited and trained as part of schemes run by 18 councils. Volunteers often apply to become what councils euphemistically call street champions through council websites, but many have also been lured by recruitment drives in local newspapers. It should be deeply troubling for us all that councils seem not content with their own snooping and are now recruiting members of the public to assist them. If a crime is committed, it is the police who should be involved, not local residents given hi-tech gadgets by councils, many of whom rarely pass up an opportunity to invade our privacy or hand out spurious fines. These individuals operate with little or no training, and there is no evidence to suggest it helps combat environmental crime. Councils seem to be unable to tell the difference between asking the public for help and getting the public to do their snooping for them. Hillingdon Council in London boasts the biggest street champions scheme with 4,850 volunteers, who record an average of 1,000 incidents a month.